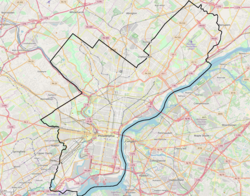 Fox Chase is a neighborhood in Northeast Philadelphia, Pennsylvania. The exterior of the Old Fox Chase Hotel, long a familiar landmark at the bending intersection of Oxford Avenue and Pine Road, near Rhawn. The hotel, built in 1705, developed a thriving stage coach business with the opening of the Fox Chase and Huntingdon Turnpike in 1848. Before 1870 it was owned by Elijah Hoffman, who operated it for many years. The hotel was sold and razed in 1940 to make way for a gasoline station. Philadelphia's elite once flocked to opulent vacation homes built in the lush fringes bordering the city. The area's character changed with the arrival of the railroad in 1876. Many of Philadelphia's aristocracy began to discover the attractiveness of suburban living, and built mansions here, using the railroad for convenient transport into the city. Fox Chase was the setting for one of America's longest running cold cases. In February 1957, the battered body of a small boy was found in a cardboard box off in the woods off Susquehanna Road. Investigators were mystified and have never been able to determine his identity. Nicknamed "The Boy in the Box", "America's Unknown Child", and sometimes "The Fox Chase Boy", his case remains open. The Fox Chase section is located on the border with Montgomery County and there is an active and cooperative business community that crosses the county line into Rockledge and Huntingdon Valley. One of many parks located within Fox Chase is Pennypack Park. It is composed of woodlands, meadows and wetlands. The banks of the Pennypack Creek runs through the park from Pine Road in Fox Chase all the way to the Delaware River. The area also includes playgrounds, hiking and bike trails as well as bridle paths for horse back riding. The Pennypack Environmental Center on Verree Road is also located within the neighborhood. Many historic structures are still intact throughout Fox Chase. The Verree House on Verree Road was the site of a raid by British troops during the American Revolutionary War. The trained eye can rediscover abandoned railroad grades, remnants of early mills, mill races and other reminders that generations of mankind have gathered in the "Green Heart" of Northeast Philadelphia. Fox Chase Farm is one of the few remaining active farms in Philadelphia County, and is used extensively by the School District of Philadelphia. It began in 1822 as a land grant from William Penn to Lord Stanley and then passed to the McVeigh family for over 200 years. Later, the Wistar family developed it into a self-sufficient farm until it became a Gentlemen's Farm owned by two farmers, Lorimer and Butler. Friends of Fox Chase Farm, an all-volunteer group, currently assists in maintaining and preserving this pastoral treasure for present and future generations. William Rhawn, president of the National Bank of the Republic in 1879, built a summer residence here. To design the project, he chose architect Frank Furness, whose work was synonymous with the mansions and public buildings of the Gilded Age. The banker's country estate includes a carriage house and gatekeeper's house. He called the estate “Knowlton” because it resembled estate in England of Rhawn's wife's great-grandfather, John Knowles. It has since been converted into a catering establishment. Ryerss Mansion is also located in Fox Chase. The house was built by merchant Joseph Waln Ryerss in 1859 and dramatically overlooks Burholme Park, one of the highest vistas in Philadelphia. The mansion is home to a massive and eccentric collection of artifacts and antiquities from around the world, collected during the Ryerss family's extensive travels and exotic sojourns, from Europe, to Africa, to the Far East. The median age is 36.6 years for males and 39.0 years for females. Married couples made up 40.3 percent of the neighborhood's population. The neighborhood was 80.37 Caucasian, 8.63 percent African American, 4.75 percent Asian, 2.58 percent mixed race, .07 percent Native Hawaiian and 3.6 percent other race. The median household income for Fox Chase was $54,870 in 2011, compared with $34,207 for Philadelphia as a whole. The population below the poverty level in Fox Chase was 10 percent, compared with 28.4 percent for Philadelphia. Public transportation is provided by several SEPTA bus routes and the Fox Chase Line regional rail service which terminates near Rhawn Street and Oxford Avenue. The Fox Chase Branch of the Philadelphia Free Library is located at 501 Rhawn St. at Jeanes Street. Fox Chase Elementary School a.k.a. Fox Chase Academics Plus School is a public elementary school of the School District of Philadelphia. Located at 500 Rhawn St. near the library, it serves children grades K to 5. Students move on to Baldi Middle School, and George Washington High School. Fox Chase United Methodist Church is located at 201 Loney St. at the intersection of Filmore and Loney streets. St. Cecilia Roman Catholic Church, 535 Rhawn St., also has a school with grades from kindergarten to eighth grade. The "new" church opened in 1955 and the first church was located just to the west of the "new" church. It was built underground with the expectations of adding an upper level, but the depression in 1929 and World War II caused this addition to be held off until 1955. St. Stephen Orthodox Cathedral is located at 8598 Verree Road (next to Pennypack Park). Bethany Baptist Church, 460 Rhawn St., open in Fox Chase since 1867. Wikimedia Commons has media related to Fox Chase, Philadelphia. ^ "Fox Chase, Philadelphia, PA". city-data.com. Retrieved January 12, 2015. ^ "Fox Chase Branch." Free Library of Philadelphia. Retrieved on November 7, 2008. ^ "Fox Chase Elementary School Geographic Boundaries Archived 2016-12-11 at the Wayback Machine." School District of Philadelphia. Retrieved on December 11, 2016. St. Mary's Ukrainian Cemetery / 438 Cedar Road, Fox Chase, Pennsylvania. This page was last edited on 7 April 2019, at 04:48 (UTC).